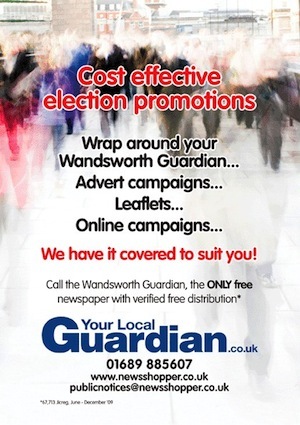 I was surprised to get image to the left as spam from the Wandsworth Guardian. I suppose it’s a lot more targeted than most spam – but I’m not sure why they are sending it to me (although the subject asked me “please forward on to whom you think will benefit”). I’m assuming few will benefit, there are fairly strict limits on campaign expenditure which I can only imagine a newspaper wrap-around would breach. Indeed, I remember a lot of trouble being caused when a well-wisher independently put a ‘personal’ ad in the local paper expressing support for John Bowis in the 1997 election. I’m also a little cynical about the circulation claims (I can’t remember the last time the paper was delivered to me) so will probably rely on our own distribution network. Personally, I’m worried that Brown is dragging this out so long that even the local paper’s advertising department has election fever. Thank God it will over be over soon. The Guardian’s circulation is a constant source of amazement. There are over 1,000 people living here in Du Cane Court in Balham but they refuse to leave any copies here at all. I’m glad they can afford to discourage so many readers – must be paid for by all the wrap-arounds!